Off Humboldt & Commerce St. on Riverboat Road Free! Don’t miss this great event as the sled dogs arrive in their little custom bus, ready to provide a great Winter experience. These extra special dogs are a recreational mushing team made up of ten rescued Siberian Huskies, two very special Alaskan Huskies, and their two mushers, Bonnie Ulrich and Rick Desotelle. Cuddle up with the pups, learn about good pet care, obedience training tips, and the sport of DOG SLEDDING with plenty of time for questions, answers, and fabulous photo opportunities! Here Come the Superstars of Winter! Dress warm and don’t forget your camera! It’s tempting, but always wrong somehow, to ascribe human attributes or emotions to animals. So it would not be right, for example, to talk about the “personalities” of sled dogs. Because oh, you want to be accepted. This community is made up of strong, likable, attractive individuals who get along and work together with a success level rare in groups of humans. Their doggy dignity can make you a little embarrassed by your nasty reptile-brained monkeyness. Maybe just for a day we could all work and play together as simply and honestly as this bunch of furry friends. This is the dignity and attractiveness of animals who work for a living. Who – quite literally – pull their own weight. Actually, according to musher Bonnie Ulrich, sled dogs can pull about twice their own weight. On certain snowy mornings, if you’re in the right place at the right time, you will see Bonnie and her husband Rick Desotelle, riding in a dog sled down Capitol Drive. Sled dogs are working dogs, and they train every single day. The Door County Sled Dogs are kenneled at Bonnie and Rick’s home in Fish Creek, where they have three acres fenced to roam around on, and 400 acres nearby where they can train. When they’re not in Door County, the whole big happy pack lives in Riverwest. “I’m a retired MPS art teacher,” Bonnie explains. The dogs stay in her art studio in a heavy industrial district that’s zoned for livestock. Bonnie’s art studio is pretty amazing in its own right. She shows children’s art at Betty Brinn Museum, urban landscapes in the Chelsea Hotel in New York City, and has a passion for the circus. But there’s nothing cute about her circus art. She shows off a 15-year project, a table full of kinetic pieces made from old record player turntables. “I do these odd things,” she notes, pointing out Mr. and Mrs. Half Sheep and the Alligator Boy in the tiny freak show display. “I really think the circus mirrors real life – the macabre, mysterious, kind of seedy parts of real life.” The little figures turn around and the music box calliope plays slightly out of tune. She laughs and says, “I’ve heard people say that walking into this place is kind of like walking into a pinball machine.” It’s true. We walk through the building to where the dogs are snoozing or playing in the back yard. As soon as the door is opened – and they are invited in – the room is roiling with fuzzy bodies. I’m struggling to catch all the names: George and Dustin, Hootch, Bob, Shadow. Little man, Jellie Mae, Cool dog. Booboo is also known as the Gentle Giant when he’s working as a therapy dog, and The Beast when he’s pulling the sled. Here’s Mushka, the puppy everybody wanted because she was the cutest in the litter, but who would have ended up in a shelter because she was so naughty. She needed something to do, so Bonnie and Rick, on the advice of a more experience musher, made her a lead dog before she was 1 year old. She loved it, was good at it, and was no longer bored. All the dogs in the Door County Sled Dogs are rescues, Bonnie says. “Huskies are notoriously naughty. People want them as pets because they’re so cute, but the dogs are really smart and they get bored and then they get into trouble. When Bonnie and Rick adopted three young Huskies, they quickly discovered they needed something for “the pups” to do, to keep them out of mischief. They discovered dog sledding, and never looked back. “We’re urban mushers,” Bonnie stresses. The sport of dog sledding includes racing and other branches, but for Bonnie and Rick it’s about running the streets and county parks and having a great time with the dogs. 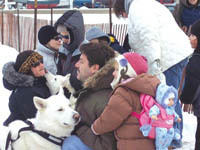 They also offer rides and educational programs about dog sledding. They approached the Milwaukee County Parks some four years ago with the idea of using the parks, and a beneficial partnership was formed. The County was looking for ways to get more people to visit the parks in the winter, and the sled dogs were looking for work. The dogs also do public appearances at schools to offer education about good pet care and obedience. They run in parades and even show up at Breakfast with Santa. “I figure with all their paid work, they bring in enough money during the year to keep them about through July,” Bonnie notes. Most of the work with the sled dogs seems to be a labor of love. Volunteers are a big part of the sled dog project. “We usually have about 20 volunteers,” Bonnie says. “It helps us keep our prices down. If mushers Bonnie and Rick have anything to say about it, there are going to be a lot more dog sled people in Milwaukee. They tell a joke about Huskies – they’re like potato chips, it’s hard to stop at just one. Eleven dogs? They both agree – that’s a lifestyle. Saturday February 4th at Gateway Park on Riverboat Road (off of Commerce St and Humboldt Blvd on the Milwaukee River) Noon to 4pm Sled Dogs will be there by 3pm. Woolly Bear Fest is free.